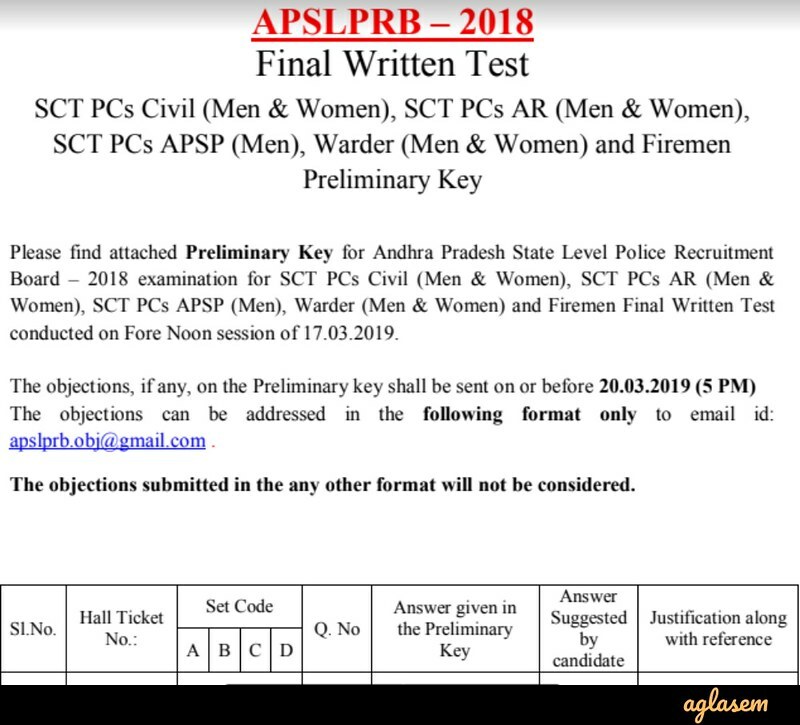 AP Warder, Fireman, PC Answer Key 2018 – The State Level Police Recruitment Board (SLPRB) has released the AP Warder Firemen PC Answer Key 2018 for the final written examination held on March 17, 2019. The candidates appeared for the examination can raise the objection against the answer key from March 17 to 20, 2019. For raising the objection candidates have to mail at [email protected] by following the prescribed format given below in the page. The AP Warder, Fireman, PC Answer Key will be released on the official website at apprb.in. The answer key is in the form pdf and containing the Set A, B, C and D set answers. Get full information regarding AP Warder, Fireman, PC Answer Key 2018. Latest: The AP Warder Firemen PC Answer Key 2018 has been released. Scroll down to check the same. From the answer, key candidates can predict their scores and can also predict the chance of qualifying the examination. For more information regarding AP Warder, Fireman, PC Answer Key 2018, check the schedule given below. Answer Key: Click Here to check the AP Warder Firement PC Answer Key 2018. 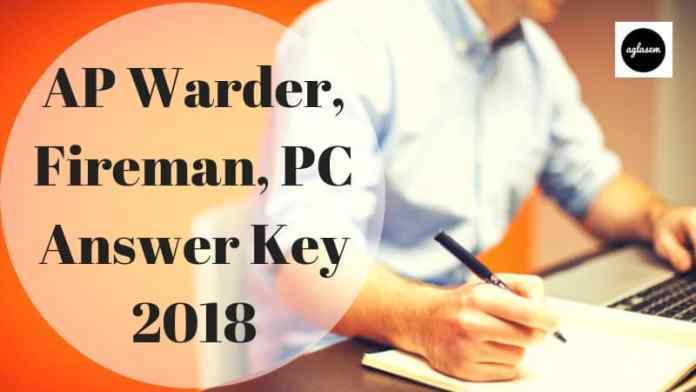 How To Check AP Warder, Fireman, PC Answer Key 2018? The SLPRB will release the answer key in the form of login. The candidates have to enter the login credentials to download their answer key. The candidates can read the steps to download the AP Warder, Fireman, PC Answer Key.. Thereafter, answer key pdf file open on the new screen. Check your answer from the answer key pdf. How To Calculate Scores From AP Warder, Fireman, PC Answer Key 2018? For calculating the correct scores candidates need to follow the marking scheme and should know the exam pattern. By following the marking scheme candidates can predict their correct scores and result. Check the marking scheme and exam pattern from below. Before releasing the final answer key, AP Warder, Fireman, PC Result 2018 has been declared. The result declared on the official website. The result is based on the performance of the candidates. The result was announced through login. The separate result will be declared for the prelims exam, PET/ PMT and final written examination.